Fire Island Air Force Station (1951-1969) - A Cold War U.S. Air Force Station, part of the Alaska AC&W Radar Network. Initially functioned as the southern master Ground Controlled Intercept (GCI) site and later as a NORAD Command Center (NCC). Assigned a Permanent System ID of F-01. The U.S. Army Nike Missile Fire Island Army Air Defense Command Post was colocated with the Air Force station from 1959 to 1969. The Air Force Station closed in 1969 and was turned over to the FAA who operated the Fire Island FAA Radar Site there until 1978. Fire Island Air Force Station in the 1950s. Construction began in 1950 and was completed in September 1951 by Pomeroy & Company Inc. at a cost of $3,485,795. The site became operational in September 1951 as Fire Island Air Force Station manned by the 626th AC&W Squadron which had been activated on 17 Nov 1950 to operate and maintain the site. Initial equipment included a CPS-6B search-height finder combination radar. An FPS-8 backup search radar and an CPS-4 backup height radar helped to fill in coverage gaps. The CPS-6B was later replaced with an FPS-20 search radar. In 1959 the U.S. Army Nike Missile Fire Island Army Air Defense Command Post was established and colocated with Air Force Radar Operations. In 1961, the site was under joint use by the Air Force and the FAA and the FAA assumed maintenance of the FPS-20 search radar. In 1965 the FYQ-9 Semiautomatic Data Processing and Display System was implemented on Alaska AC&W radar sites automating the passing of track data to the direction centers. In 1969, the Air Force ceased operations at Fire Island and inactivated the 626 AC&W Squadron. In 1970 the Air Force transferred the site, including all real estate property, to the FAA. The U.S. Army in Alaska established two Nike Hercules missile air defense areas, one for the Anchorage area and one for the Fairbanks area. The Fire Island Army Air Defense Command Post (AADCP) was one of two AADCPs in Alaska, colocated with NORAD command posts on Murphy Dome and Fire Island. 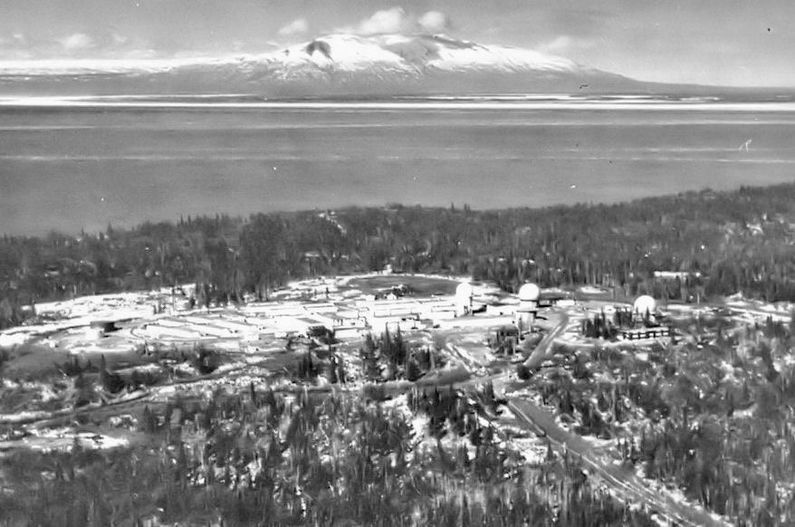 The Murphy Dome AADCP controlled the Fairbanks area Nike Hercules missile batteries while Fire Island controlled the Anchorage area Nike Hercules missile batteries. In late June 1968, there was 21 Army personnel manning the AADCP at Fire Island, 4 officers, and 17 enlisted men. Communication between the Fire Island AADCP and the actual NIKE missile batteries was by microwave communications links. In 1969, when Fire Island AFS and its NORAD control center closed, the Fire Island AADCP relocated to Site Point in Anchorage. Battery A had two firing units and one was deactivated circa 1969. The AADCP occupied the empty building of the deactivated firing unit sometime prior to November 1971. During the interim period between the closing of Fire Island AFS on 15 Oct 1969 and November 1971, it has been reported that a temporary AADCP was set up at Fort Richardson. The FAA operated the Fire Island FAA Radar Site with an FPS-20 radar set until the new Kenai FAA Radar Site was ready for activation. The FAA deactivated the site and departed in 1978. The Kenai FAA Radar Site was commissioned with an ARSR-3 search radar on 1 Aug 1980. The Fire Island AFS was built on the highest hill on Fire Island as a single level site with the buildings conforming to the standardized Alaska AC&W site design. The standard design included some 26 wood framed buildings with interconnected hallways but the arrangement of the buildings varied to fit the terrain. At closure, FUDS documentation records 33 buildings and structures. The search radar tower was usually placed nearest the operations building with the height finder radar tower(s) flanking the search tower. At Fire Island AFS there were two additional radars, backup search radar, and a backup height-finder radar. The cantonment area buildings included the enlisted quarters (BAQ), the bachelor officer's quarters (BOQ), NCO quarters (NCOQ), the orderly room, the dining hall, recreation buildings, motor pool, and other support areas. No family housing was provided as this was considered a remote unaccompanied tour (1 year). Even though the site was just 9 miles southwest of Anchorage and the lights of the city could be seen from the site it was not easily reached. Strong winds and high tidal bores made air and sea transportation difficult at times. The site was resupplied by sea annually with the Mona Lisa and later Cool Barge programs. Emergency supplies and fresh food were brought by air from Elmendorf AFB. An airstrip was built at Fire Island but the March 1964 Good Friday Alaskan earthquake lowered the airstrip enough that it flooded during high tides and had to be abandoned. Air resupply of fresh foods, emergency supplies, mail, and personnel changes had to be accomplished mainly by H-21 helicopters. A replacement airstrip was built in the north-east end of the island. 17 Nov 1950 - Established as the 626th AC&W Squadron at Fire Island Air Force Station, AK. Assigned 531st Aircraft Control & Warning Group. 13 Apr 1953 - Assigned 10th Air Division. 1 Jun 1957 - Assigned 5039th Aircraft Control & Warning Group (later 5040th Aircraft Control & Warning Group. 1 Nov 1959 - Assigned 10th Air Division. 1 Aug 1960 - Assigned 5070th Air Defense Wing. 1 Oct 1961 - Alaskan Air Command. 15 Oct 1969 - Deactivated. Most of the old AC&W site buildings and facilities were demolished in 1985 with the exception of one building housing water tanks which still appears on satellite images. Location: Anchorage in Municipality of Anchorage, Alaska. Denfeld, D. Colt Ph.D., The Cold War In Alaska: A Management Plan For Cultural Resources, 1994-1999, U.S. Army Corps of Engineers, August 1994, 327 pages, Pdf, page 121, 153-154. History of the Aircraft Control and Warning System in Alaska: Air Defense of Arctic Skies, Argonne National Laboratory, Illinois, 2002 updated 2013, 140 pages, Pdf, page 18, 34-35. Hollinger, Kristy, Nike Hercules Operations in Alaska: 1959-1979, Conservation Branch, Directorate of Public Works, U.S. Army Garrison Alaska, July 2004, 79 pages, Pdf. This page was last modified 08:21, 26 December 2018 by John Stanton.